Supertall skyscrapers around the globe are soaring to vertiginous heights. When American architect and engineer William LeBaron Jenney designed Chicago’s Home Insurance Building in 1884, it rose to the then-astounding height of 180 feet, spawning fierce debate about its safety and forcing the city to change its building codes. Generally considered to be the first skyscraper, the building employed skeleton construction, a technique still used to build today’s supertall towers—though it’s unlikely that Jenney could have imagined buildings such as Saudi Arabia’s Jeddah Tower, which will ascend 3,281 feet into the desert sky. Modern supertall skyscrapers like the Jeddah Tower dot skylines around the world, from Tianjin, China, to New York City. Here are six stories that illustrate why the 21st century could be considered the age of the supertall skyscraper. Think all supertall buildings need to be constructed out of steel, concrete, and glass? Although the 1,148-foot W350 Project will consist of some steel (it’s currently designed to have a 9:1 wood-to-steel ratio), Sumitomo Forestry and architecture firm Nikken Sekkei believe they can build a beautiful wooden tower that will be able to withstand Tokyo’s seismic activity. With the boom in supertall future skyscrapers comes the problem of how to move people thousands of feet vertically, and elevator manufacturers such as Kone, Thyssenkrupp, and Otis Elevator have realized that the traditional method of using cables and pulleys leaves much to be desired. As a result, these innovators have been experimenting with everything from carbon-fiber cables to magnetic systems that would allow elevators to also move sideways, opening up new options in big building design. As anyone who has tried to buy property in Manhattan will tell you, space is at a premium—and you will pay accordingly. To get around that issue, developers have begun to construct skinny supertall buildings with width-to-height ratios ranging from 1:10 to 1:23, a trend that opens up new design opportunities and will drastically alter the Big Apple’s skyline. 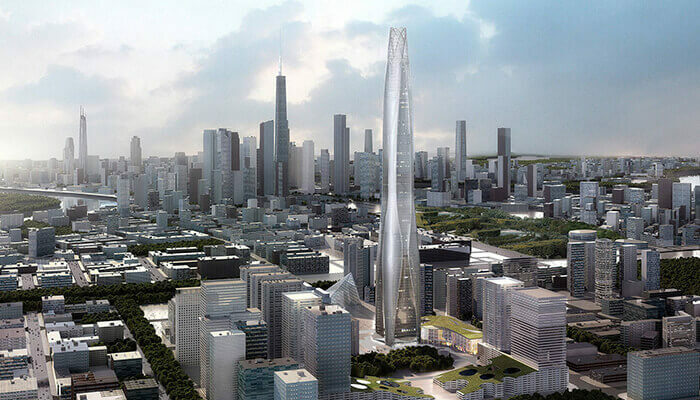 The Tianjin Tower will stand 103 stories high and aims to achieve LEED Gold Certification. Courtesy China Construction Eighth Engineering Division. How do you build a 103-story supertall tower that meets LEED Gold standards? When the China Construction Eighth Engineering Division took on the project of building the Tianjin Chow Tai Fook Financial Center, the company used advanced building information modeling (BIM), prefabrication, and industrialized construction processes to create an aerodynamic, curved structure that can withstand severe seismic activity. See how China is changing the way future skyscrapers will be built. From Beijng’s 1,732-foot China Zun Tower to St. Petersburg’s Lakhta Center (which will be Europe’s tallest building), 2018 will continue the trend of supertall buildings changing urban skylines. Designed by British architect Tony Kettle, the Lakhta Center will stand 1,516 feet tall and be part of a complex that includes an amphitheater as well as sports and educational facilities. Dubai is no stranger to supertall, modern skyscrapers—the small kingdom already boasts the tallest building in the world, the Burj Khalifa, but it will soon be dwarfed by the Jeddah Tower, a project that was temporarily delayed by concrete-related design issues. Now back on track, the tower will be completed in 2019 and will feature a Four Seasons hotel and an observatory.